Hummingbirds are colorful little visitors. Whether you want to attract them with feeders or the plants in your yard, attracting them is quite easy. This is a guide about attracting hummingbirds. 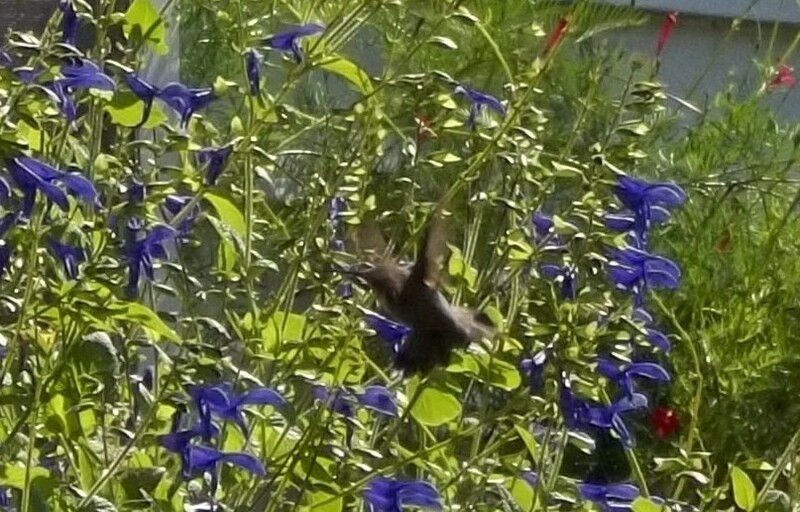 One of the greatest joys of having a flower garden is watching the hummingbirds dart from flower to flower-wings buzzing away while their tiny bodies hover in mid air. Late winter signals the start of the hummingbird migration as they head back to their breeding grounds in the United States and Canada. The males will return first, with the females arriving a few days behind them. 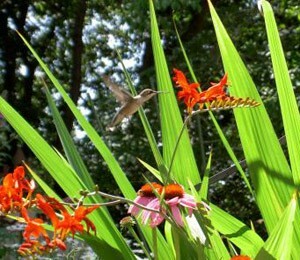 Here are some tips for attracting hummers to your garden this year. There are 16 species of hummingbirds in the United States and Canada. The Ruby Throated hummingbird is the most common. A hummingbird can beat its wings anywhere from 60 to 200 times per second, fly at speeds of up to 60 mph, and migrate more than 600 miles. In flight, they are capable of maneuvering forwards, backwards, from side-to-side and even stopping in mid flight. The average lifespan of a hummingbird in the wild is 5-6 years. 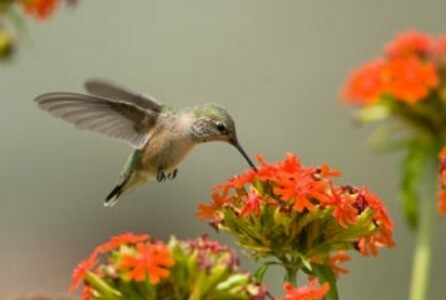 A hummingbirds diet consists primarily of nectar and insects. They lap nectar using long, grooved tongues, which empty into their throat when they constrict their bills. Hummingbirds do not sing true 'songs'. Instead, they communicate using trills and chirps. 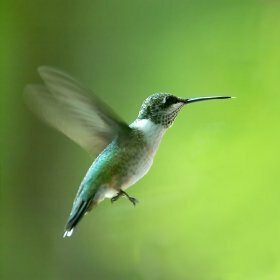 As the smallest birds in the world, hummingbirds have incredibly fast metabolisms. To stay fueled up, they must consume roughly half their weight in sugar each day. When hummingbirds need to conserve energy they go into a sleep-like state called 'torpor'. Torpor requires 50 times less energy use than a fully awake state, but renders the hummers unable to respond to emergencies. During torpor, their body temperature may drop by as much as 50 degrees and their heart rate slows from 500 beats per minute to 50. It takes approximately 1 hour for a hummingbird 'wake up' from torpor. Hummingbirds have poorly developed feet (they can hardly walk), but they do like to perch. Abelia, Azalea, Bottle Brush, Butterfly Bush (Buddleia), Cape Honeysuckle, Catoneaster, Hibiscus, Flame Acanthus, Flowering Current, Flowering Quince, Lantana, Lilac, Manzanita, Mimosa, Red Buckeye, Tree Tobacco, Turk's Cap, Weigela. Bougainvillea, Coral Honeysuckle, Cypress Vine, Morning Glory, Rosary Vines, Scarlet Runner Bean, Trumpet Creeper, Trumpet Vines. Annuals: Beard tongue, Firespike, Fuchsia, Impatiens, Jacobiana, Jewelweed, Nasturtium, Petunia, Salvia, Shrimp Plant, Spider Flower, Zinnia. Many gardeners choose to supplement the diets of neighborhood hummingbirds by offering them sweetened water from a feeder. Feeders are widely available at discount stores and garden centers. Most common are the plastic inverted bottle-style feeders and basin feeders. When selecting a feeder, look for one that is easy to clean and maintain, and preferably, one that offers perches. Despite their underdeveloped feet, hummingbirds will gladly take advantage of a chance to rest while they feed (and you'll get some great pictures). Use hot water to rinse the feeder every time you refill it. Periodically, (maybe once a month) soak the feeder for two hours in _ cup bleach and one gallon of water. Rinse well and refill with syrup. Ideally, feeders should be hung near windows-close enough to watch the action. Cutouts of predatory birds or partially closed vertical blinds will prevent bird strikes on windows, although that seldom seems to be a concern with hummingbirds. It isn't uncommon for hungry hummers to empty feeders quickly so check them daily. Also, be aware that in some areas (parts of the southwest), sugar loving bats also like hummingbird feeders and may empty them overnight. These bats are important pollinators to desert plants, so don't harm them, just bring your feeder indoors for the night. 1 part ordinary white cane sugar to 4 parts water. Boiling this syrup is not necessary. Fermentation problems are caused by organisms on the bird's own beaks, not by the water. Unused syrup can be stored in the refrigerator for up to 2 weeks. Syrup will spoil quickly in warm weather so discard any unused portions after a few days and refill with fresh syrup. Do not use Jell-O, honey, brown sugar, or fruit in your feeder. These can harm, and in some cases even kill hummingbirds. Do not use distilled water (it lacks important trace minerals) or red dye to color the water in your feeder (the base of most feeders are colored and if not, hummingbirds are smart enough to figure it out anyway). 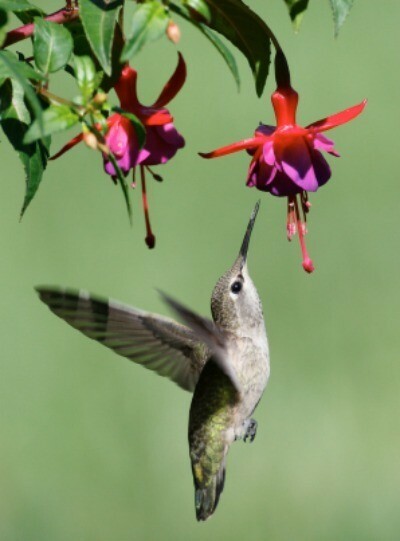 When I put up my first hummingbird feeder, my husband and I were sitting on our patio, and as he was saying "I don't think we'll get a hummingbird here", a Ruby Throated Hummingbird comes swooping down to take a drink of nectar from the feeder I had hung. 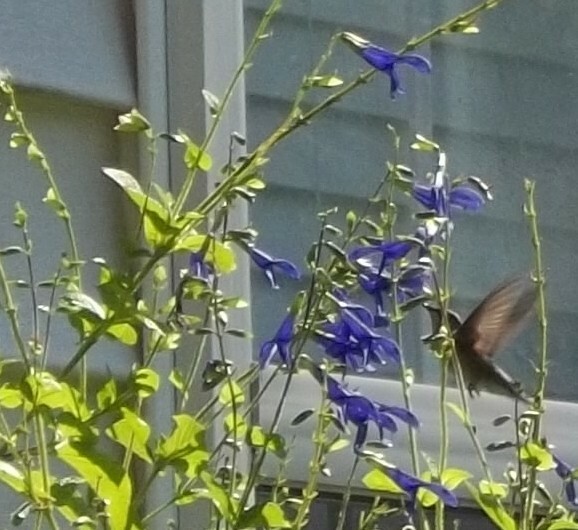 Tip: Hummingbirds And "Four O'Clocks"
For the first time, I have hummingbirds in my yard. For the first time, I grew salvia coccinea, and the hummers love it. 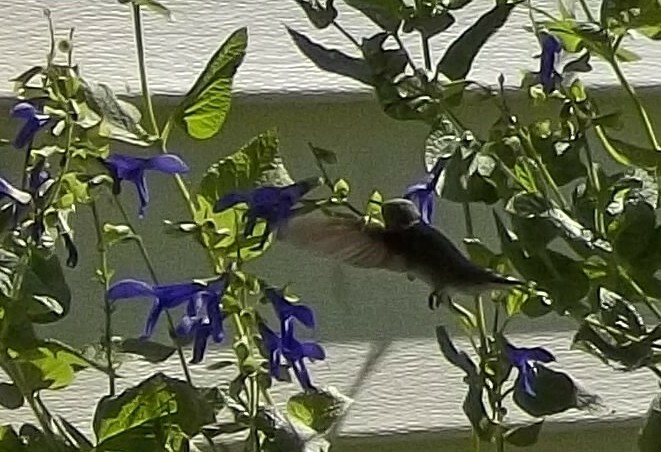 I also have petunias, nasturtiums, and some "four o' clocks" that I've heard hummingbirds like, but have never seen them at those flowers. Hanging baskets are a great way to attract hummingbirds to your garden. Once they find your flowers, they will return again and again, to dine on them all season long. I have lots of flowers outdoors, and we usually we get about 1-2 hummingbirds. This week we've counted 4 at one time. I went outdoors with a red shirt on, holding the hummingbird feeder with my arm outstretched. 2 hummers came up, and 1 ate from the feeder as I held it. I was given this wonderful pass-along plant, Salvia guaranitica. I was told the common name was "Hummingbird Plant" and now I know why! This fabulous and beautiful plant has long, tubular blossoms that attracts hummingbirds. 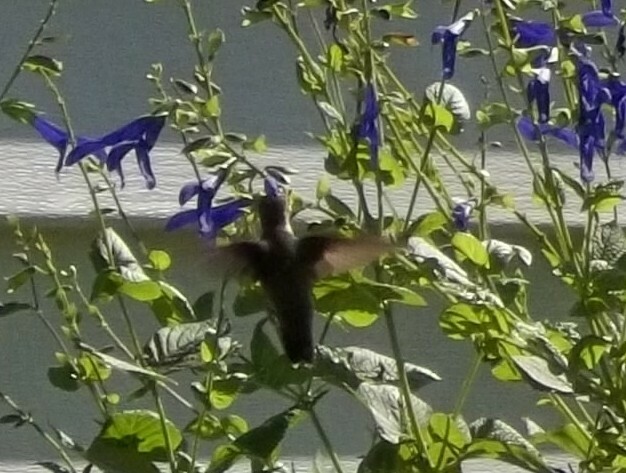 I have thoroughly enjoyed the addition of both plant and hummingbirds in my summer garden. After the initial flush of bloom, I pruned the stems and it flushed again! I would highly recommend this plant for anyone who enjoys nature!